Ideal for small to medium workgroups who need a reliable all-in one device with a broad range of functions including: print, copy, color scan, email, walkup fax, PC fax, LAN fax. 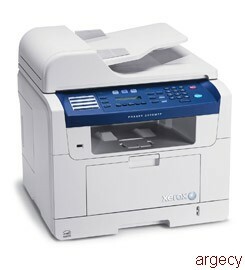 Built to handle all of your office tasks with fast print speeds up to 30 pages/minute, maximum duty cycle of 25,000 pages per month, paper handling up to 8.5" x 14" and maximum paper capacity of 550 sheets. Reduce toner consumption and save money with a variety of features like variable sleep mode and toner saver mode, which prints all solid areas as a shade of gray instead of black. A single, high-capacity toner cartridge results in fewer consumables to change and less frequent ordering. Additionally, the device is ENERGY STAR qualified for reduced energy costs. Advanced features like digital workflows let you route electronic and scanned-in paper documents to their correct locations on the network. Remote management tools such as CentreWare IS embedded web server give you quick access to toner status, device setup, email/fax address book, security settings and email alerts. Protect your documents with built-in security features including: secure fax, scan to email authentication, SSL, HTTPS, IP filtering and LDAP authentication for simple and secure access restriction. Back-up device data such as address books with CentreWare IS or a USB flash drive. Dimensions (WxDxH): 18.3" x 17.1" x 18"; Weight: 41.6 lbs.